Have you ever rummaged through a box of covers at a show and found a "Gem"? I've been collecting Scout stamp commercially used on covers for 33 years. A challenge, indeed, excitement at its best. About 75% of all Scout stamps never see a postally used cover. We all know that they are issued only to fill the collectors' albums and the pockets of the countries who issue them. Some small countries rely on stamp sales for substantial income such as the Vatican, Liechtenstein and many of the islands. 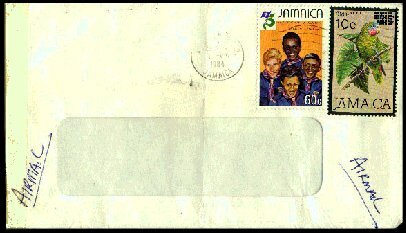 First Day covers, not really postally used, are made again for the collector. Pretty, but never mailed. They are easy to get, but not much of a challenge. Try your hand at seeking out these commercially used items. It's really fun. My wife and I are world traveled and many times over the years I took the country's stamps with us that we planned to visit. With these stamps, I mail home letters to myself, thereby creating a commercially used cover. I have just received a beautiful cover from one of the islands with Scout stamps. I had just written to a man there in February. He even enclosed some patches which were a special treat. This is a Gilbert & Ellice Islands 1957 cover with the Great Britain Scout 2.5d cancelled B.F.P.O. CHRISTMAS ISLAND cds. This cancel was used by British troops stationed there during atomic testing. In closing, I urge you to try this end of the hobby. You'll like it. It's not really expensive and most fascinating. If you are looking for something new, try a Scout stamp cover treasure hunt. Good Luck.